My family bought its first Litton microwave in the early-80s. My childhood is fraught with memories of microwave experimental cooking such as monkey bread, spam, and macaroni and cheese in that wonderful large humming contraption that even had its own stand in the far corner of our kitchen. Perhaps it was something about that faux wood-grain siding that housed the new appliance, or the nice new Formica stand that gave the microwave a sense of importance in our kitchen. Although technically I’m a child of the “microwave generation,” this wonder appliance always left dinner somewhat lacking. 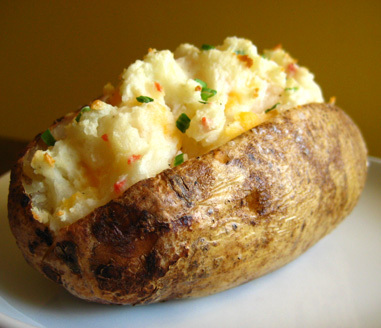 Yes, you could nuke a baked potato in a couple of minutes, but what did it leave you with? A spud with some mushy spots, some burned spots–it was not a good substitute for anything resembling a baked potato that we adore ordering from Outback Steakhouse. Then brown rice entered the cuisine and suddenly, the microwave seemed useless. Taking the time to plan a whole hour ahead and actually bake those spuds and cook that rice on the stove – what a difference. Through in some homemade biscuits and it seemed like Betty Crocker moved in. Yes, being a work-at-home, stay-at-home mom affords me some luxuries that my own mother didn’t have – I’m here to plan more meals and cook things that take a long time. I’m grateful that I can be patient enough for real baked potatoes in the oven and tasty brown rice cooking away on the stove to pair with broiled salmon on occasion. Sorry, my microwave friend, but you don’t hold a candle to 60 minutes and a homemade side dish. I’ve got to go now, it’s time to take my baked potatoes out of the oven.